In 2017, the National Academy of Medicine's clinician well-being initiative asked the community to answer the question "what does clinician well-being look, feel, and sound like to you?" with their art project. The goal was to promote greater awareness and understanding of barriers to clinician well-being—and solutions that promise a brighter future. 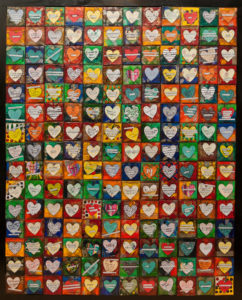 One hundred and eighty hearts were completed in less than one week (full list of answers here- heart of medicine font3) and then incorporated into this mixed media art piece. Trainees, staff and faculty painted the canvases and completed initial steps and then it was finished by Dr. O’Malley, who has always used art with mixed media and mosaic as an outlet for creative expression and to support her own wellness. She takes this after her father who kept his heart in medicine for 45 years as a neonatologist and crafted the frame. Photos of the piece were then taken by Dr. Robert Koch, a third year Internal Medicine resident. The piece was among 30 selected from among 350 submissions to the NAM show and Dr. O'Malley was invited to present during the panel discussion at the May 2nd meeting in Washington DC. Photos of the piece are now part of an online gallery and traveling art show to increase awareness of issues related to clinician well-being.